Harbour Tower 511 allows you to relax and enjoy the scenes of San Carlos Bay and beyond from the large wrap around balcony of this 5th floor condo. 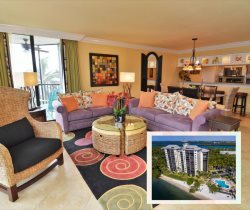 This Sanibel Harbour Condo on the Bay features renovated kitchen and bathrooms in Fall 2016. New and comfortable furnishings throughout with a light beach cottage feel with new appliances. Views from every room to enjoy the natural beauty of a private oasis. From the balcony of this rental you will enjoy panoramic sunsets and you are sure to enjoy the playful dolphins that frequent our waters. The master bedroom has 1 king bed and the guest room has 2 twin beds and a sleeper sofa in the living room. We did not have any specific needs, but any time we noticed team members throughout the property, they were polite and willing to help others. We enjoyed a gorgeous week at this property. We had beautiful weather, and spent much of our time on the beach and at the pool. We have stayed in many resorts, and this property was ALWAYS well maintained and clean. It was quiet, secluded, and enjoyable for couples as well as families. The condo we rented was roomy and had amazing views. Amenities were close by; there was nothing we needed for the week that wasn't provided or easy to access. It was so hard to leave and go back to reality. I cannot wait until we are able return! Our first visit to the Fort Myers/Sanibel Island area. The condo was exactly as pictured. The furnishing were nice and comfortable. The view was superb. Checking in and out was seamless. We will definitely stay at Resort Harbour on our next visit. Wonderful experience again. This is our 7th time vacationing at your property and we are never ever disappointed. Wonderful and relaxing. Unit 511 was so pretty and clean. The views were lovely and the pool area was well maintained and always so clean. Great restaurants not far from the resort. Great shopping too! Resort harbor properties is most certainly "my happy place". We loved our stay here. Check in was seamless, the condo was very nice, so clean, well stocked, very comfortable. I don't have a single negative thing to say. We enjoyed the pool, the beach and the restaurants. I would certainly book here again and would stay in this same condo. This was our 2nd stay, and we will return. Very nice. Unit was clean and comfortable. We had a few friends over and I went to staff and asked about Pizza delivery. They recommended a place and our friends thought is was an choice on our part to use them. Our stay was better than expected. The rooms are large the Windows over looking the ocean was just great. Parking was easy, pools and hot tub were nice. Already looking to book next year!